Reviewed by Fred Worbon Sept. 9, 2008 and Sept. 16, 2008. I love sushi! I crave it constantly. I might even consider killing my own mother for a plate of sashimi! It is like my kryptonite: I become powerless in its presence. My stomach seems to have no bottom when I am seated at a sushi bar. I have even tried eating full meals before going out with friends to a sushi bar to stifle my appetite and still find myself with a bill of over $100. If sushi eaters anonymous existed, I would likely be found regularly at meetings talking about my recent relapse and maybe the time I lost my apartment or job because of my habit. I'm pretty sure that it would be cause for divorce if my wife wasn't also a fan of Japanese food. There are quite a few decent places to gorge one's self on nigiri and maki rolls here in Salt Lake, but nothing comes close to Takashi when it comes to freshness, quality of fish, creativity or service. This might be due to the fact that the owner and head chef Takshi Gibo and his wife Tamara are always around and tending to the place. Service is the only thing that I have ever heard criticized there, or more accurately the G-Star hipsters that both work at and frequent the place. In my experience, the service has always been top notch, but that could always be because I am one of those skinnypant- wearing, track-bike-riding, tattooed douche-bags. So, it's obvious that this review is not entirely unbiased, but to be fair, I did make two separate visits this last month and tried to be as objective as possible. My first visit was on a Tuesday afternoon at about 1:45 p.m., 15 minutes before the end of their 11:30-2:00 lunch. I was seated at the bar in front of chefs Ryan Maning and Tony Rivera, and being a regular, I was greeted warmly rather than being scorned for being a last minute customer. When seated at the bar I usually take the opportunity to talk to the chefs about which fish is particularly good and order based on recommendation instead of off the menu. I started with a glass of Momokawa Pearl sake, a roughly filtered drink served chilled that is creamy in texture and slightly sweet, with a bowl of miso soup ($2). 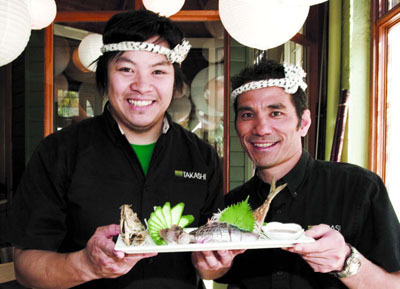 Tony recommended the nigiri tombo ($5.25), a Hawaiian tuna that's not always available. It had a distinct lemon flavor that turned into a strong, but pleasant, fishy taste. Ryan then served up a sashimi plate of aji (MP), a Spanish mackerel served with the edible crunchy carcass of the fish next to the raw meat with a side of the house ponzu dipping sauce. The flesh of the fish was delicate and mild with just a hint of smoke to the flavor, but it's the flash-fried skeletal remains that I love. They're crisp and rich, almost creamy, with a hint of something roasty, almost like coffee, but not as bitter. The ponzu ads a sour saltiness that lingers on the breath. I followed this with a nigiri order of sea trout ($5.50), a beautiful bright orange fish with white striping. It had the texture of cream cheese and was sweet and rich. After that, I quickly made myself scarce so that the staff could get on with prep for that evening's dinner. The following week, I returned in the evening with my wife. We decided to head over early because there is usually a good, long wait if you arrive after 6 p.m. This time, we opted for a seat in the dining room rather than the bar and after looking the menu over for a moment, my wife and I decided to do something we had never done in the four years we have been frequenting Takashi�we decided to order from the dinner menu instead of the sushi menu. After some deliberation, I decided on the ridiculously tender flank steak ($18.50)�that's their name for it, not mine. My wife ordered the veggie sampler ($16), and an appetizer from the Dine-O-Round menu of kabocha soup made with Japanese pumpkin and cr�me fraiche that, after tasting, I hope becomes a regular offering. It tasted like Thanksgiving, all roasty and sweet. The food was exceptional; my steak came with seven-spice rub and Asian pesto on the side. It was cooked to a mediumrare perfection, near bloody in the center with a nice char around the edge and so tender that I could cut it with my chopsticks. The spice was nice, but not overwhelming and it tasted of smoke and BBQ. The small, firmly packed patty of BBQ rice and tempura green beans that accompanied the meal were also quite nice. The veggie plate consisted of a miso grilled eggplant, agedashi tofu, tempura vegetables and edamame. It is a great option for vegetarians who are not interested in the many veggie rolls offered on the sushi menu. One of my favorite things about Takashi is the fact that they are one of just a few Japanese restaurants in the country that offers real grated wassabi root (by request only) a sweeter, slightly less spicy option that tastes more of seaweed than battery acid that most of us have come to associate with that green horseradish stuff next to the pickled ginger on our plates. A few other can't-miss menu items are the wok-tossed asparagus small plate ($9), T&T roll tempura fried and served with hotter than hell sauce, and the near famous hakozushi ($13.95), also known as "the box." This roll is almost beyond description. As I said in the title, if you don't like this place, you can piss off, because I have never found anything but perfection there. Hours of Operation: Lunch: Mon. - Fri.11:30a.m. - 2:00p.m. Dinner: Mon. - Thurs. 5:30p.m. - 10:00p.m.